RV Investigator will be formally commissioned in Hobart today. The day has finally arrived: our new 94 metre, A$120 million research vessel (RV) Investigator will be commissioned in Hobart today. 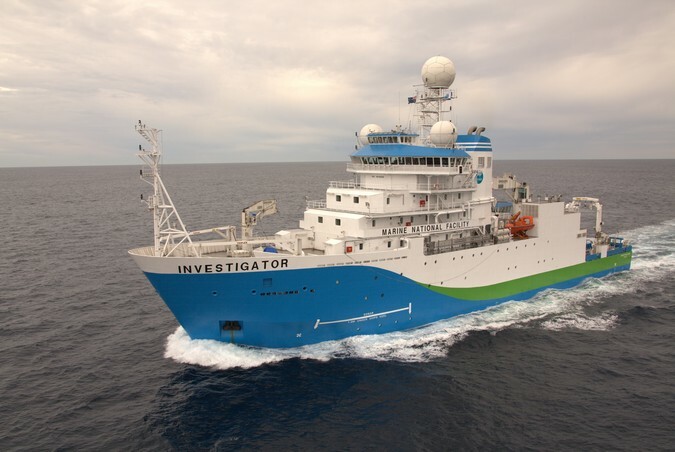 This marks Investigator’s transition from being a CSIRO ship building and commissioning project to being Australia’s new Marine National Facility ship, ready to embark on its maiden voyage in March 2015. You may have noticed we’ve been making quite a bit of fuss about the Investigator recently. Here’s three* good reasons why. First of all, she’s good news for Tasmania. Between them, Investigator and the Marine National Facility pump somewhere between $7 million and $11 million a year into the local economy. In the last ten years Hobart has become a marine and Antarctic science hub. CSIRO’s Oceans and Atmosphere Flagship and the University of Tasmania’s $45 million Institute for Marine and Antarctic Studies (IMAS) headquarters are located there, along with a large number of other marine and Antarctic bodies. Investigator will enhance this. providing a greater understanding of the changing dynamics of the ocean floor (such as the movement of tectonic plates, which can trigger tsunamis). And third, as Federal Industry Minister the Hon. Ian Macfarlane MP explains, she brings greater capacity to do research across Australia’s marine territory. For example, we know more about the surface of the moon than we do about our deepest oceans, and only 12% of the ocean floor within Australia’s Exclusive Economic Zone has so far been mapped. With the Investigator we will now be able to map the ocean floor to any depth, search for resources, better understand our fisheries, collect weather data 20km into the atmosphere and much more. She’s an awesome sight. 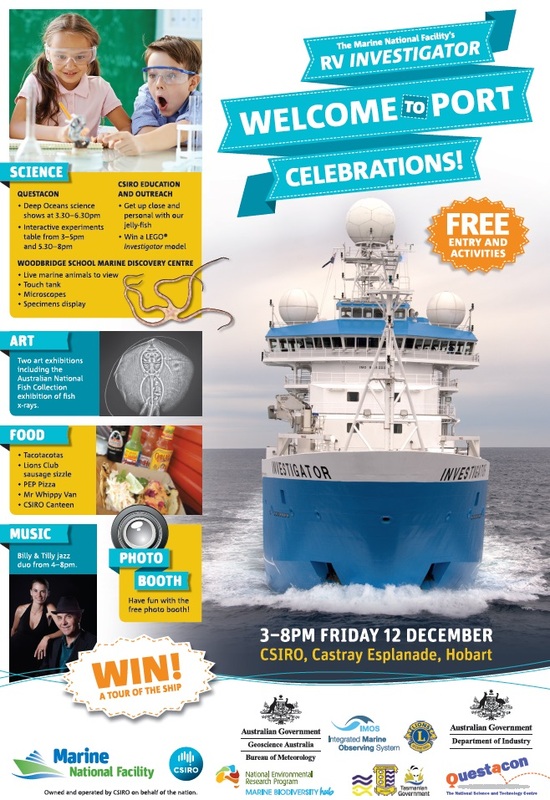 If you’re in Hobart this afternoon, be sure to come down and check out the official Welcome to Port event. We’d love to see you! *An extra super bonus reason we love the Investigator? Nautical puns. Great result… what about the crew that had to nut the project out to build this masterpiece? Must be some really marvelous stories there. It’s a beautiful thing. Why in Heaven’s name is it being called a “marine national facility” ship? In 1984 the Australian Government established the Marine National Facility to operate Australia’s only ocean going research vessel. The facility has had three ships, ORV Franklin, RV Southern Surveyor and now RV Investigator. The Marine National Facility (MNF) is a blue-water research capability funded by the Australian Government. Under direction of an independent Steering Committee, the Facility is owned and operated by CSIRO on behalf of the nation. – the governance, expertise and systems required to manage blue-water research and support research vessel users. The MNF is available to all scientists employed by an Australian research organisation and their international collaborators. Access is granted on the basis of proposals that are internationally peer reviewed, and independently assessed for science quality and contribution to the national interest. The sun’s out and the champagne’s been smashed(http://ow.ly/FLqwL)… It’s the RV Investigator’s Welcome to Port day! There’s a shipload of activity taking place in Hobart for this event today, but let’s step back for a second and take a look at just why the Investigator is worth all this fuss. Dive on in and explore below!